We are delighted to inform you that our Brochure for 2014 includes some special features as Ffestiniog Travel marks its Ruby Anniversary Year! You can now view our special 40th Anniversary Brochure and take a look at our personal journey over the past 40 years and where we plan to travel during 2014 - including a celebratory 'Around The World' tour that aptly is 40 days long! Don’t worry if you can’t commit to 40 days, you can join the tour at various stages as it circumnavigates the Northern Hemisphere passing through Europe, Russia, Mongolia, China, Canada and the USA. We can arrange all transfers from your nearest airport to a suitable point where you can join the tour. Our annual escorted tour programme features nine new tours for you to consider. As a customer based outside the UK you can still join any of the holidays featured in the brochure. We value our overseas customers and will arrange all your transport requirements to enable you to join any of our escorted rail holidays. You may be tempted to visit us here in the UK and join one of our home-run rail tours. Fittingly for a company with its roots firmly embedded in the Principality, 'Wales: from North to South' takes you through stunning Snowdonia National Park to the capital, Cardiff, with visits to many of the country's famous independent railways, castles and museums along the way. Experience some of the most scenic parts of the English railway network on a 'Railways of the North' tour, visiting three preserved railways and journeying through remote regions of the Yorkshire Dales and the North Pennines. Our 'West Country Wanderings' tour blends rail travel, river cruises and the renowned gardens and stunning scenery of Devon and Cornwall. Or sample Scotland's Highland delights on 'Orcadian 2', - a 14-day rail odyssey riding the spectacular Kyle Line and The Road to the Isles, marvelling at the northern moors en-route to Wick and Orkney, steamer sailing on Loch Katrine and visiting Balmoral Castle. Our European tours include familiar journeys around Switzerland, a commemorative tour to France to mark the 100th Anniversary of the start of WW1 and, in addition to our annual visits to Romania, we continue exploring the Balkans with our 'Pushing the Boundaries – Kosovo, Macedonia & Albania', tour - a fascinating 13-day holiday that’s perfect for travellers seeking a more adventurous experience. A candid online travel blog - giving a flavour of Ffestiniog Travel’s recent research trip to the area - can be viewed here. Further afield we have added some exotic destinations to complement our annual visits to North America and India and they include Vietnam, Eritrea and Mexico. Please note that if any of our 2014 escorted rail holidays aren't suitable because of dates or the itinerary isn't quite right, you can create your own. Our team of expert travel consultants provide a Signature Tour service that will help you plan and fulfil your dream rail journey. We produce personalised, bespoke tours designed to meet your requirements whether as an individual, a couple or part of a group. Talk to us about your ideas and our team will work with you to plan your itinerary and you won’t have to commit to anything until you are entirely happy with your own personal, 'signature' tour. Enjoy browsing through our electronic brochure or look at the tours direct on our website at www.ffestiniogtravel.com. To keep up to date with all our travel news why not 'like' our Facebook page at www.Facebook.com/FfestiniogTravel or follow us on Twitter @FfestiniogTrvl. Don’t hesitate to contact us direct by calling 44 (0) 1766 772030 or emailing info@ffestiniogtravel.co.uk to talk through any of the tours or discuss a specific rail journey you would like to take. 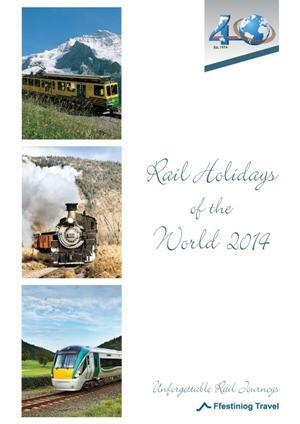 We hope you can share our special year by travelling with us during 2014.